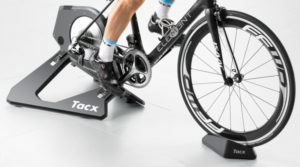 Using a single neodymium magnet and a 1.5kg virtual flywheel the Minoura LR540 generates 433 Watts of power at training speeds of 40km/h and 672 Watts of power at training speeds of 60km/h. This resistance is controlled via a handlebar mounted quick release resistance shifter and generated through and Advanced Magturbo brake on which your rear wheel rotates. The Advanced Magturbo brake is an upgrade to the original Magturbo brake, which was the first ever used on turbo trainers anywhere. The Advanced brake is quieter and more powerful than its predecessor. 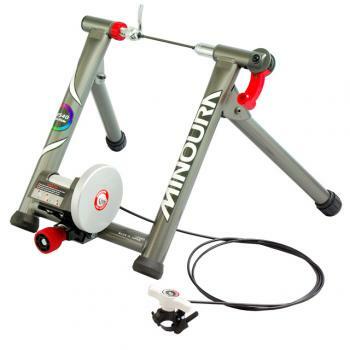 The LR540 is part of Minoura’s higher-end LiveRide turbo trainers and is compatible with their Live Training software. This software runs off an app of iOS Apple mobile devices, and allows you to download and ride courses from all over the world, upload you own GPS courses, and analyse an array of metrics to improve you workout experience, such as power output and cadence.